Hello everyone! This is our first attempt at a blog, all of the previous blogs were posted by a robot and so we are trying to make our homepage more personal and more tailored to our patient base (and we won’t lie, it’s cheaper this way). We hope you enjoy our first blog and we hope Dr. House’s grammatical errors do not drive you crazy! Disclaimer from Dr. House: Longer term scientific studies need to be done to prove any of the following information. The following is not my (as a dentist) recommended course of treatment but I am sensitive to the fact that my patients do have autonomy (independence or freedom of will to make their own decisions). This blog is intended to help my patients who believe in a more holistic approach to their oral hygiene not to sway people away from time tested and scientifically proven methods of oral hygiene. If you’re going to be holistic at least do it right (or as right as we can be with the knowledge we have at this time)! I want to start off by saying that I do fully support my patients who choose a holistic approach as long as cavities and gum disease stay away. In my practice I will never force you to use fluoride or reprimand you for not using it. Just for a little background on me, I am half Native American or American Indian depending on which is the more politically correct that day. My mother is full blood Paiute from Nevada, we are proud members of the Pyramid Lake Paiute Tribe. I have also worked in US Public Health System on reservations with the Indian Health Service in Oklahoma. During my time working on reservations in Oklahoma I encountered many elders who do believe in a more natural, holistic way of life…so I understand that sometimes choices are not always for health concerns, choices can be made for cultural or religious reasons as well. Every patient has their own reason (health, cultural, religious, lifestyle, etc) for choosing a holistic or natural route and I respect that. This article is intended for my patients who do go the holistic route. I want you to choose options that are non-harmful and may provide benefit to your oral health. I know the main thing that holistic or alternative medicine patients dislike about toothpaste is the fluoride. Fluoride is the main active ingredient in toothpaste (look on the back of your toothpaste tube), so I will give my quick argument as to why you should use fluoride and toothpaste (I am not slapping you on the hand for not using fluoride or regular toothpaste but I am telling you why I professionally think you should use it). The first thing to know about your teeth is that they act like sponges in your mouth and they have the ability to absorb things. Proof of the ability of your teeth to absorb substances can be seen on any coffee drinker, or smoker…stain. The staining or yellowing of teeth comes from your teeth having the ability to absorb colored substances into the tooth structure. While your teeth can absorb stain, they can absorb beneficial minerals as well. Fluoride is a colorless mineral that can be absorbed by your teeth but is also has a very unique feature in that fluoride can actually change the structure of your tooth enamel making it stronger and more resistant to cavities (if you want to nerd out for a minute, the tooth structure changes from hydroxyapatite to fluor-hydroxyapatite). Fluoride is not some lab creation, it is a naturally occurring element. In fact the way it was discovered was in the drinking water of a Native American tribe in Colorado who had stained teeth (fluorosis from ingesting too much fluoride) but no cavities. Fluoride has a bad rap because if you ingest (eat or drink) a lot of fluoride it does have effects to the rest of your system (fluorosis mentioned before is a visible side effect). When using toothpaste you are topically (putting it on the surface) applying fluoride to the outer surface of your teeth, we do not advocate you eating toothpaste and that is why you spit it out after brushing. Later in this blog we will talk about ways of replacing mineral in your teeth but do not confuse this with replacing fluoride. We all go through phases of demineralization (losing mineral in your teeth), and remineralization (putting mineral back into your teeth) as we eat or drink foods through the day. Replacing mineral in your tooth is normal and necessary (or else your enamel starts to wear or you get cavities) but remember that fluoride is unique because it actually alters the structure of your teeth (that hydroxyapatite to fluor-hydroxyapatite nerd thing we talked about earlier), so there is no ‘replacement’ if you choose not to use fluoride. So you have chosen not to use fluoride, in this case you need to make sure you are fully replacing all of the mineral that you do lose on a normal basis to keep your teeth headed towards remineralization as much as possible. The two best minerals for your teeth are calcium and phosphate. While it does help to ingest both of these (with dairy or other sources), there are actually dental products designed to enhance the level of mineral in your mouth topically either in combination with fluoride (for those of those of you who use fluoride) or without. One of the most common products is MI paste which is derived from milk proteins, so you may have to avoid this if you do have an allergy or intolerance to any of the ingredients. MI paste contains Calcium Phosphate and Casein Phosphopeptide which help to put calcium and phosphate back into your tooth. The other big benefit of MI paste is that it actually increases the pH of your mouth with the calcium and phosphate ions which makes it harder for the bacteria that cause cavities to reproduce. The bacteria that are involved with causing cavities love acid, and every time we have acidic food or foods that bring down the pH of your mouth (carbhoydrates are the most common) these bacteria wake up and become active starting the demineralization process (removal of minerals from your teeth). Having a less acidic or more basic oral environment keeps the bacteria in a more stagnant state while encouraging your teeth to accept more mineral into them. MI paste comes with or without fluoride so if you do not want fluoride make sure you get the right kind. If you do use fluoride there are other products such as ClinPro (a prescription strength fluoride with calcium and phosphate), and some other over the counter products. While baking soda (or Sodium Bicarbonate) is still using an altered version of a natural substance, it contains no fluoride and has long been used as a way to clean teeth so we are including it as a toothpaste alternative. Baking soda works because it is abrasive (like the grit in toothpaste), it raises the pH of your mouth (slowing down those acid loving bacteria that cause cavities), and it also reduces the number of bacteria because sodium bicarbonate is a basic salt and this helps disrupt the membranes of some of the bacteria in the mouth. The main benefit of baking soda is that it raises the pH of the mouth (bicarbonate can be found naturally in the mouth and is a pH buffer naturally in the body) shifting the mouth towards remineralization and away from demineralization of the tooth. Lots of people do like the whitening effect of baking soda and this comes from the abrasiveness of baking soda. Unfortunately this abrasiveness is also one of the negatives of baking soda…it is too abrasive. While it does remove stain, long term use can also lead to wear of the enamel and gum tissue if improper brushing techniques are used. If you are looking for a natural home whitening remedy you can soak your tooth brush bristles in hydrogen peroxide and then dip the peroxide moistened bristles into baking soda and then you can brush with this. It will not whiten your teeth as much as options offered in a dental office but it will likely remove some stain but once again this is NOT for daily use, do this maybe 3-4 days in a row in a month and then give your enamel a break. 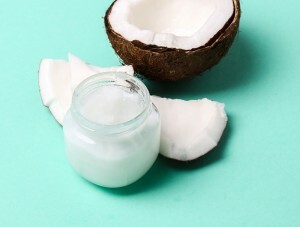 A more popular way that a lot of people are maintaining their oral hygiene is with oil pulling. Oil pulling is when a patient swishes with about a tablespoon of an essential oil for a certain amount of time. Oil pulling is effective mainly by the mechanical action of swishing and forcing liquid around your teeth for several minutes (some studies say 10 minutes is the minimum number of minutes you must swish vs 30 seconds with Listerine). Mechanically swishing with most liquids for long enough would basically remove most of the food/bacteria/debris away from the surfaces of your teeth. Oil pulling does have another benefit besides the mechanical removal of bacteria by swishing. It is believed that when bacterial cells come into contact with the oil, “a fat,” the lipid (or fatty) membrane of the bacteria is attracted to the oil causing the bacteria to be removed. Coconut oil is the preferred oil because 50% of the fat in coconut oil is comprised of the bacteria fighting ingredient lauric acid (an ingredient found in many soaps). Lauric acid is believed to have antimicrobial actions; it may inhibit Strep mutans which is the primary bacteria that starts the tooth decay process. Other oils that are less effective are sesame and sunflower oil. These oils are less recommended because these oils have omega 6 fats that are pro-inflammatory (increase inflammation), and most of us have too much of these in our diet as it is. Xylitol is a product that can help with dental decay (less helpful for gum disease). Xylitol is a sugar that is naturally found in the bark of birch trees, corn cobs and husks, berries, oats, and mushrooms, and in small amounts in other vegetables and fruits. Xylitol works by interrupting the life cycle of Strep mutans, the primary colonizer bacteria in the cavity formation process. Basically the less cavity causing bacteria that you have, the less chance of getting cavities. Xylitol has to be consumed regularly and at a high enough dosage (at least 2 grams/day) to see benefit from it. Xylitol also has other properties that allow it to help absorption of calcium which could help with allowing more calcium to be present in your body along with more calcium present in saliva (this effect is still being studied). Xylitol does have one side effect, xylitol can have a laxative effect because sugar alcohols are not fully broken down during digestion. Xylitol is also toxic to dogs, so keep it away from your pooches. Teeth cleaning sticks, Miswak or Siwak, are another natural way of maintaining oral hygiene. People in India, Pakistan, Middle Eastern countries, and African countries are known to use these sticks in place of toothbrushes but worldwide use is increasing. These sticks work similar to a toothbrush by mechanically removing debris and plaque due to friction between the plant fibers and tooth. Some of these sticks contain silica (main component of sand) and sodium bicarbonate (baking soda mentioned above) which have mild abrasive benefits (similar to the grit in toothpaste). These sticks often contain essential oils which coat the teeth and help reduce levels of the bacteria that cause decay and gum disease. 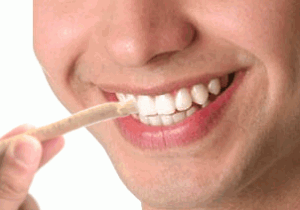 While there are benefits to the gums and teeth, there are studies that do report that gingival recession (recession of the gums) may be a side effect with overuse or improper use of Miswak. The WHO (World Health Organization) is investigating these sticks as an option for oral hygiene in place of tooth brushing in low income areas of the world. The main thing that can be done to improve oral hygiene is to improve your overall health. If you eat healthier, exercise, and maintain your weight to avoid being put on lots of medications (one of the main side effect of most medications is dry mouth) your mouth will respond also because believe it or not your mouth is connected to the rest of your body. Eating vegetables with lots of fiber aids not only in digestion but also mechanically cleans your teeth. Having the right amount of vitamins and minerals (phosphate and calcium) will also benefit your teeth as we talked about remineralization above. Avoiding processed foods, especially refined sugar and carbohydrates, will do wonders for your teeth and overall health. While I can’t fully recommend all of the things mentioned in this article until there is more long term scientific studies done, I do respect that not every patient’s desire to care for their body in the way they deem the most appropriate. I, as a dentist, fully support your desire to do the best possible thing for your body and I am always trying to read more about alternative oral hygiene routines. If you ever have any questions feel free to ask me if I am your dentist. And if I am not, hopefully your hygienist or dentist can steer you towards options that are appropriate for your individual situation. I approve of my patients doing any or all of the treatments recommended above as long as they remain cavity free and their periodontal (gums) conditions remain stable BUT if we do note that changes occur (more cavities or worsening of gum problems) then I do recommend we do add some proven methods for improving oral health. Thanks for reading the first blog entry that I have ever posted myself (bye bye robot post-bot). Hopefully this was a little educational without being too boring, and gave you some new information. Wilton Manors Office 1201 NE 26th St.